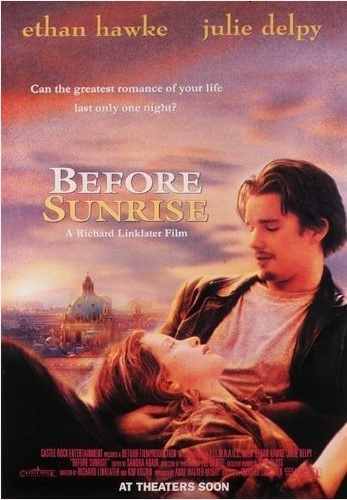 “Before Sunrise” was a 1995 movie starring Ethan Hawke and Julie Delpy. It’s a movie I have not watched before, until tonight. I’m trying to catch up as much as I can on movies, trying to explore some recent, old, or ancient movies that I can get my hands on. I got a copy of this movie whilst searching for the “before” series, including “Before Sunset” (2004) and “Before Midnight” (2013). I would probably try to watch the two sequels in the next few days or weeks, but for now I only know of the first movie. To be completely honest, I found the movie a little bit dragging somehow. Perhaps because of the constant tone and feeling to the movie throughout, from start to finish. It was not bland, though. There were no highs or lows during the entire movie, just a constant sense of romance, a simple story-telling of an exciting kind of “love story”. Nonetheless, it was a beautiful story and movie. Quite interesting, too, to be familiar with that kind of story, that kind of romance. It did remind me of something, of someone. To be traveling in a strange place, to meet people, to fall in love with someone who you’ll never know if you’ll ever see again. That perfect situation actually rids you of the fear of falling in love – the fact that there are no rules or expectations, that you take everything in at that very moment, not thinking about the past or the future, not considering the “realities” of your life. Let me not get into details. What I can only say is, I can relate. It is my favorite trilogy and these movies are so grounded in real life that it’s very easy to connect to them. Touche. Great arguments. Keepp up the amazing spirit.